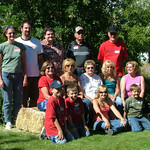 We had an awesome time last weekend at my grandma’s family reunion at her sister’s house in Carson City, Nevada. Six brothers and sisters, in their 70s, 80s, and even 90s, were there, along with many of their children, grandchildren, great-grandchildren… etc. It was a long drive for us (11 hours each way), but it was totally worth it. Check out the photos of the reunion, the trip to Carson City, and the trip home. We left San Diego on Friday morning, July 17, intending to drive all the way to Carson City (estimated drive time: 10 hours). But, we left late, and then we got stuck in more traffic than usual at LAX. By the time we got up the Grapevine, I realized we wouldn’t make it to Carson City at 8 pm like I originally thought. Since it seemed unreasonable to get there any later than that, we decided to go through Fresno instead and spend the night at my parents’ house. That was great because I actually got to see my sisters, which was unexpected. On Saturday we got up very early and drove up the valley to Sacramento, then east through Tahoe to get to Carson City. The party was fun, hanging out with a lot of relatives that I hadn’t seen since I was a tiny kid, and meeting a few new ones. We spent the night in a tent in Aunt Joan’s back yard, which was a lot more comfortable and warm than it sounds. 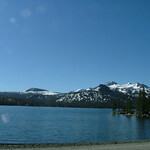 On Sunday, we left around 8 am and took a more scenic route, Highway 88 through the Sierras. It was beautiful and actually saved us about 20 minutes of driving time. We hit Hwy 99 and zipped down the Valley back to my parents’ house to celebrate Father’s Day. We didn’t end up leaving until quarter to 4 (later than anticipated – again! ), and although the drive went well, we had to stop for dinner, so we didn’t get home until after 10 pm. Then went straight to bed!